The English language does have its limitations. We often try to name places of natural beauty based on how we feel about them. Realizing our inability to do so, one word works. Indescribable. Early adventurers tried using nouns. Unable to describe the scenery they saw, they came up with names for it instead. Canyonlands National Park has one spectacular characteristic. Standing rocks. In fact it becomes apparent there are more rocks standing up than lying down. As stark and oppressive as this land seems, man has been here, off and on, for a long time. Centuries ago, ancient men lived here as is apparent in the artwork they left. Hundreds of years later, men searching for gold and silver bet their lives against the terrain. And later, they were followed by those searching for uranium. But, of course, like many at that time, they were looking for ways to gain commercially and materially from the land. They weren’t “tourists” or conservationists. Most people will describe this lonely land as beautiful. But once they venture into, it can become somewhat haunting. It used to be easy to get lost here wandering from one dead end to another. Still is. Even with today’s modern GPS and a good map. 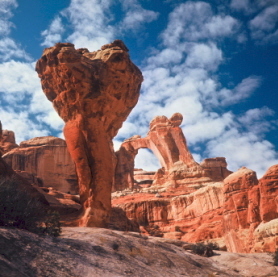 When the area described as “Canyon Lands” became a National Park in 1964, conservationists were disappointed that only 257,000 acres were included. 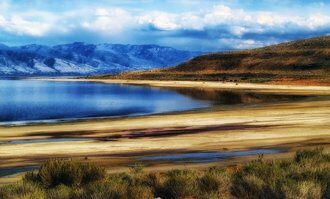 There were at least 800,000 acres of mostly federal land that could have been included. 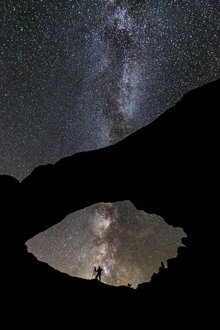 As you might expect, the Governor of Utah ... according to the Interior Secretary ... made it clear he was against the park status that would lock up resources and “damage” his state’s economic future. As with so many of the other protected lands throughout the state, this seems to have been the ongoing mantra. It’s amazing how much revenue is now being generated for the “state” from the millions of people who come to visit each year. One of the most famous views in the world is that atop Dead Horse Point State Park located just east of Canyonlands National Park and northeast of Island in the Sky. 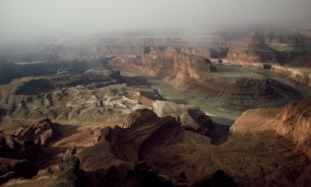 It’s a panorama of the Colorado River as it winds its way through the “canyon lands” below. 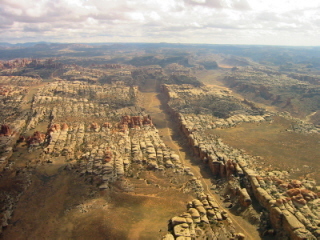 For many years, the phrase “Canyon Lands” was used to describe a sizeable part of southeastern Utah. 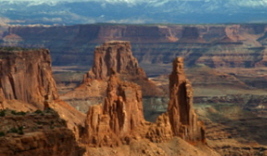 In 1964, Canyonlands National Park officially joined the National Park system. 257,000 acres. The Green and the Colorado Rivers join in the heart of the park. 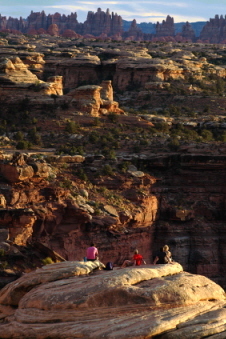 This confluence divides Canyonlands National Park into three distinct districts. No roads or bridges connect the three districts. Travel between them becomes a long though scenic journey. To the north, wedged between the two rivers lies the Island in the Sky. 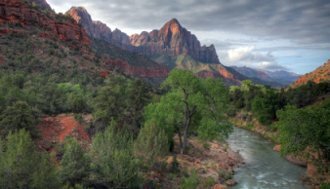 To the southeast, you’ll find the Needles where crowded spires, canyons and narrow valleys create an almost impenetrable terrain. To the west, the Maze. Remote. Convoluted. A country for only the hardiest of adventurers. Both the Island in the Sky and the Needles have a Visitor Center. Wedged between the two rivers ... the Green and the Colorado ... are sheer sandstone cliffs rising high above the White Rim Bench. The Wingate Sandstone cliffs. 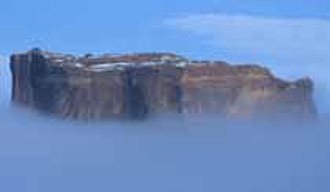 On top of these cliffs lies the Island in the Sky mesa. You can survey the park from the top of a 6,000 foot high mesa. The views from up there are astonishing. Spectacular sights like the Washer Woman Arch pictured below. 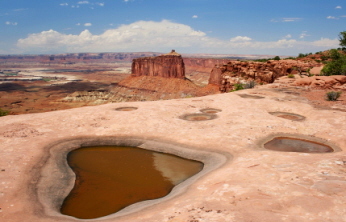 One of the most popular overlooks in Canyonlands National Park is Grand View Point. 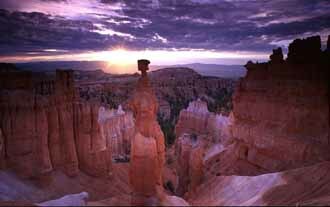 The view is dominated by Monument Basin and a tall spire called the Totem Pole. A July 1971 issue of National Geographic chronicled the author’s raising of a helium-filled balloon to try to measure the Totem Pole’s height. 305 feet high is what he came up with. 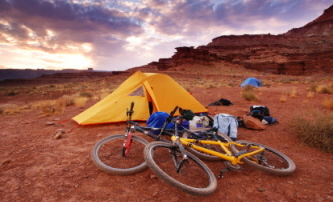 Whether you enjoy mountain biking or four-wheeling, the White Rim Road offers some of those “indescribable” scenes I mentioned above. A breach in the Wingate Sandstone cliffs enabled Indians, cowpokes and miners to trail-blaze a path known as the Shafer Trail. This is where your trip down the White Rim Road begins. The only road access onto the Island in the Sky Mesa is via a land bridge called the Neck. The Needles is located in the southeast corner of the park. Once you see the Needles, you’ll know where it got its name. Spires everywhere. Narrow valleys. Canyons. Rugged and seemingly impossible to enter. So easy to get lost in. Cairns – piles of rocks – mark the trails guiding you through this bewildering landscape. The land here is dotted with pinyon and juniper trees. Rainfall is rare and precious. Any wildlife you might be lucky to find is well suited to the environment. Water flows off mountains into Horse Creek and Salt Creek canyons providing sustenance for water-loving cottonwoods. They add a spectacular touch of gold in the fall. The Needles seemingly impassable terrain forced early surveying to be done from the air. And not until the 1950’s. Major features discovered from the air became targets for further exploration by four-wheel drive vehicles. Arches and archaeological sites were identified and mapped out. 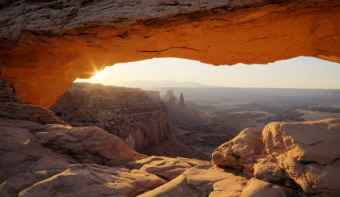 Since Canyonlands National Park was first established, its signature symbol has been Angel Arch. Visitors to the area hung the name on it 1953. Some of the other popular destinations in the Needles are <Salt Creek. High canyon walls. Unique archaeological sites. The Pothole Point Trail loops around an area of slick-rock embedded with numerous potholes. 6/10 of a mile long. After storms, these basins fill with water. The trail offers great views of the Needles in the distance. And unique photo opportunities. The Needles area has few paved scenic drives. Venturing off these roads will allow you to discover a whole new world many never see. Horsehoof Arch is located in the back-country near the Horsehoof Arch Campground. The Maze. Remote. Convoluted. Fit only for the hardened mind and body. A journey into the Maze requires careful planning. Four-wheel drive vehicles only please. No paved roads or tourist facilities are found here. 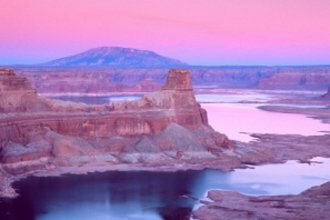 Most people entering this area reach it by descending the precipitous Flint Trail and venturing through Glen Canyon National Recreation Area. A long bumpy arduous drive finally gets you to the threshold of the Maze. The Chocolate Drops - rocky guardians seen for miles – perch along the top of a canyon wall. 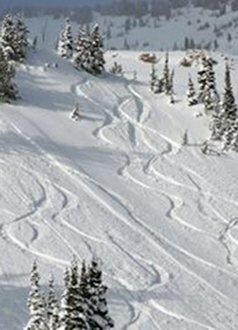 There are few trails here. If you are fit and able, you can spend days wandering around some of the most remote and wild canyons on the planet. 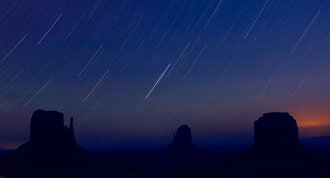 Canyonlands National Park shows evidence of human habitation going back centuries. Rock art - Anasazi pictographs and petroglyphs – is still visible today. Some created over 800 years ago. What they mean is anyone’s guess. An area where only early Native Americans, miners and ranchers ventured has now become a playground for hardy outdoor enthusiasts.